Utes are 3-4 at home in conference games, awaiting the visits of USC and UCLA. (David Zalubowski | The Associated Press) Utah guard Sedrick Barefield, center, is fouled by Colorado forward Evan Battey, right, while driving the lane past guard McKinley Wright IV during the first half of an NCAA college basketball game Saturday, March 2, 2019, in Boulder, Colo.
Boulder, Colo. • Asking the Utah basketball team to deliver a seventh road win in Pac-12 play probably was too much. The immediate issue is whether winning their last two home games also is too ambitious for the Utes. “Our biggest thing is, just go home and defend home court,” senior guard Sedrick Barefield said after Saturday’s 71-63 loss at Colorado. That would defy Utah’s trend. The visits of USC (Thursday) and UCLA (Saturday) to the Huntsman Center offer the Utes one last chance to sweep a Pac-12 homestand for the first time this season. Such an achievement would guarantee Utah (15-13, 9-7) a top-four finish and a first-round bye in the conference tournament in Las Vegas. Because of the Utes’ home-court performance and the packed standings, the other extreme demands to be discussed. How far would the Utes fall if they’re swept by the Los Angeles schools? The No. 10 seed is unlikely, but just about any other placement is in play for the Utes, who are tied with Oregon State and UCLA for third place, one game ahead of three other teams. ESPN’s analytics suggest a split for Utah this week. Depending on the tiebreakers, that might be sufficient for a top-four finish — especially if the win comes against UCLA. The Utes could have helped themselves Saturday, when they lost at Colorado to finish their conference road schedule with a 6-3 record. Utah shot 5 of 26 from 3-point range, even though few attempts were forced or tightly contested. Most were generated by passes from inside, and players were not often having to create their own shots to beat the 30-second clock. They just kept missing. Utah will need shots to fall this week against teams it beat on the road in decidedly different fashion in early February. The Utes held on at USC after building a 20-point lead in the first half, then rallied from 22 points down in the last 12 minutes at UCLA. • If the Utes finish 11-7 in Pac-12 play, this season has to be considered a success and would bolster the belief that coach Larry Krystkowiak’s teams improve as they go along. If they end up 9-9, after being 8-4 in mid-February, that would make the season a disappointment. A 10-8 mark would be subject to debate. That’s how much is at stake this week. “We know how big these games are, especially us seniors, and the younger guys trying to send us out on the right note,” Barefield said. • Anecdotally, the Utes always seem to start slowly. They trailed Colorado 8-0, although they scored the next nine points. The season’s numbers, according to Krystkowiak, say Utah’s worst stretch is the last five minutes of the first half. That was true Saturday. The Utes started that segment down by five points, got within four, then gave up the last five points as Colorado took a 35-26 lead. 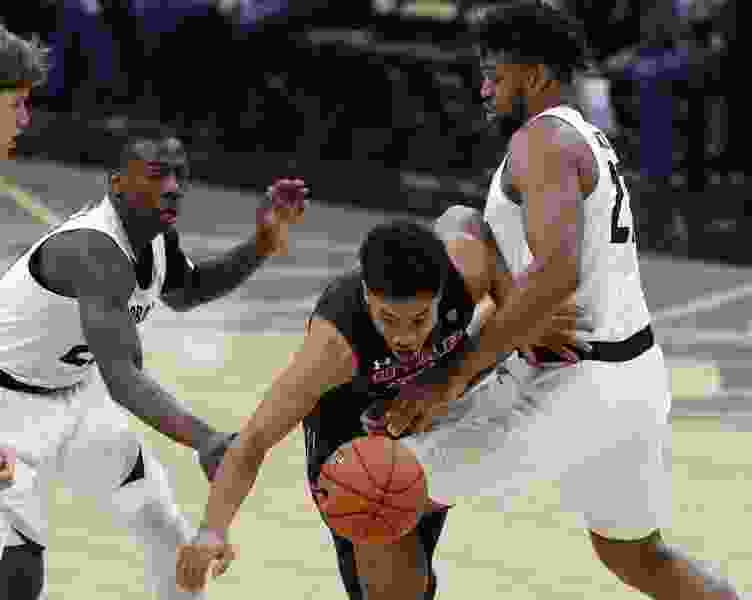 Donnie Tillman's missed 3-pointer and Timmy Allen's offensive foul resulted in empty possessions, while the Buffaloes got two free throws and a buzzer-beating 3-pointer. • It was not a great weekend for the current or future Utes. Incoming freshmen were favored to win state championships, but center Matt Van Komen’s Pleasant Grove team lost to rival American Fork in the Class 6A title game and guard Rylan Jones’ Olympus team lost to eventual champion Corner Canyon in the 5A semifinals. Allen. His return to action was imperfect, as he had four turnovers in his first action after missing two games with a back injury, but he generally looked good. The Utes beat Washington State without him, but imagine Saturday’s outcome if Allen had remained sidelined. Utah outscored Colorado by one point in the 29 minutes Allen played; the Buffaloes had a 15-point edge in the 12 minutes that Riley Battin played. Allen posted 11 points, three rebounds, three assists and three steals. He made a rare 3-pointer, going 1 of 2 on a day when his teammates were 4 of 24. Tillman’s consecutive 3-pointers. Those shots came after the Utes started 1 of 13 from 3-point range and pulled them within 30-26, before they faded at the end of the half. This will be a pivotal week for the legacies of senior guards Parker Van Dyke and Barefield. Two victories would give them a nice ending at the Huntsman Center, where the Utes have lacked much of a home-court aura lately.